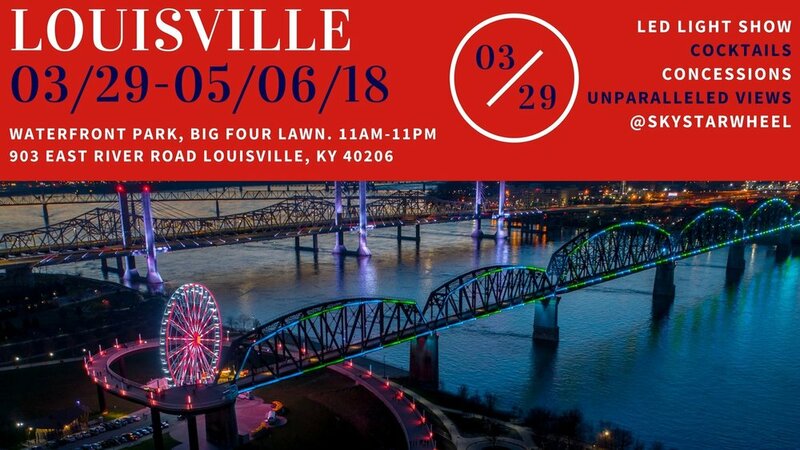 The SkyStar Wheel, Rolling Across America™ made its debut March 29th 2018 at the base of the Big Four Bridge® within Louisville's Waterfront Park ! SkyStar's Lousiville residency took place during Louisville's most notable events, such as Thunder Over Louisville, Waterfront Wednesday, and The Kentucky Derby. Learn more about Waterfront Park by clicking here. Special thanks to our Louisville, KY on-site concessions: Lil Cheezers & Festival Cuisine and Spirits!